Walt Disney World Resort's fourth and newest theme park celebrates one amazing adventure after another with wild animals, exciting attractions, lavish stage shows and lovable characters. Highlights include an authentic African safari, Expedition Everest, a whirling white-water raft ride and a thrilling race back in time to prehistoric worlds. The park is in the middle of a huge expansion opening in 2017 that will bring an entire new land to the park - AVATAR, a new nighttime show 'Rivers of Light,' and enhancements throughout the park. From Walt Disney World property: take World Drive to Osceola Parkway West. From off Disney property: take I-4 to Exit 25B (U.S. 192 West), to World Drive North, to Osceola Parkway West, to Disney's Animal Kingdom parking plaza. 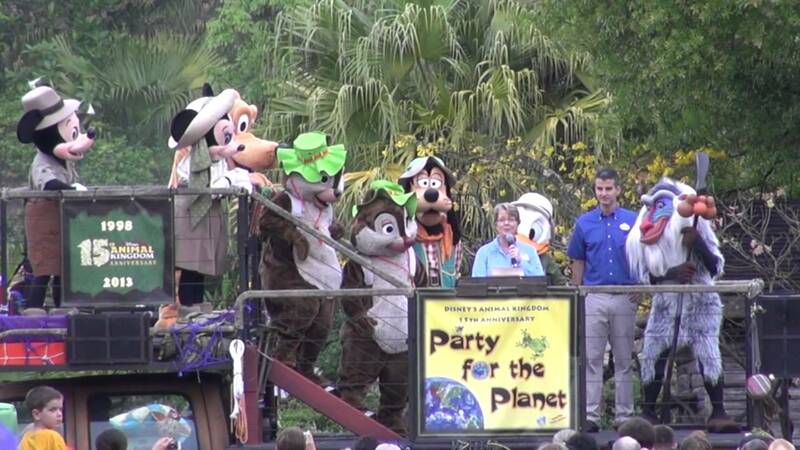 Africa, Asia, AVATAR, Discovery Island, DinoLand U.S.A.
Goofy & Pluto in DinoLand U.S.A.
Donald Duck in DinoLand U.S.A.
We were there at the Grand Opening of AK and have watched the park grow over the years but here is the problem 1) lack of good food options 2) Asphault ground makes the park hotter than it already is. 3) Park closes early as oppesed to other parks 4)You have limited rides. Safari, E.E., Rapids, Dino and Whirl and kid ride and boneyard. Kids will only look at the animals for a short time so if you get there first thing in the morning you will be done by 1ish with a show or 2 you will be done by 3. We usually go here the day we arrive or the day we are leaving or go and take off for pool when we have a dinner that night. Animal Kingdom is beautiful, no argument there. The ambiance and theme of the park is bar none, and it really removes you from the rest of the world. The few attractions that are there are all top notch (with the exception of Dinorama). Those are the good things about the park, on to the bad. I know those who really love the park will tell me that I'm taking in Animal Kingdom the wrong way, but to them I offer this point: You can do all of the rides, watch nearly all of the shows, walk on the treks, eat, and appreciate the theme, but you will still be done at 3 or 4. That still makes Animal Kingdom a half day park in my eyes. When we go to Disney World, Animal Kingdom is usually only visited once in our 6 or 7 days there. Not because we don't like it, but because we've done nearly everything multiple times. All the park needs is an expansion. (A rather large one). Walt Disney World Resort's fourth and newest theme park celebrates one amazing adventure after another with wild animals, exciting attractions, lavish stage shows and lovable characters! Highlights include an authentic African safari, Expedition Everest, a whirling white-water raft ride and a thrilling race back in time to prehistoric worlds. Location: From Walt Disney World property: take World Drive to Osceola Parkway West. From off Disney property: take I-4 to Exit 25B (U.S. 192 West), to World Drive North, to Osceola Parkway West, to Disney's Animal Kingdom parking plaza. Animals: About 1,500, representing 250 species -- most acquired from zoos accredited by the American Zoo and Aquarium Association. Landscaping: More than 4 million trees, plants, shrubs, vines, grasses, ferns, etc. representing 3,000 species. Entry Garden:The Oasis -- A lush botanical garden designed for guests to explore habitats of fascinating creatures including iguanas, tree kangaroos, several species of colorful birds and other animals. Africa - Journey through the "wild" savannah that seems to put you in the heart of Africa with lions, zebra, giraffes and other magnificent animals roaming freely. There's also an authentic African village filled with sights and sounds of the mysterious continent. Camp Minnie-Mickey - Now closed, but was originally the site to meet many of the lovable Disney characters, including Mickey Mouse and friends from classic Disney films. Live shows included "Festival of the Lion King." DinoLand U.S.A. - Here's where the world's fascination with dinosaurs and jungles comes to life: race back in time to save the last dinosaur on the thrill ride DINOSAUR; The Boneyard Dig Site lets kids dig, swing and giggle through a prehistoric playground; and the live stage show "Finding Nemo The Musical". Discovery Island - The park hub and home of the towering icon, The Tree of Life, which houses within its trunk "It's Tough to be a Bug," a humorous 3-D and special-effects show in the Tree of Life Theater. Discovery Island also features gifts and food emporiums and the bright tropical colors of hand-carved animal architecture. Asia - Home of Expedition Everest, the parks biggest and newest thrill ride. Kali River Rapids, a white-water raft adventure through a threatened rainforest; Maharajah Jungle Trek, a surprising walking journey past Asian ruins and live exotic animals; and the thrilling "Flights of Wonder" exotic bird show.